The world of online poker bonuses is confusing to say the least. You have probably seen bonuses advertised as a “No Deposit Bonus”, “Match Bonus”, or “Sign-up Bonus”. On top of that each Poker Room has their own poker bonus code listed as either a “Bonus Code”, “Poker Marketing Code”, “Coupon Code”, or “Poker Referral Code”. Yikes! Those are way too many things to decipher if you just want to play poker. The purpose of this poker bonus guide is to define what all these bonus related terms mean so that you can figure out the best place to sign up and get these online poker bonuses. The poker sign-up bonus is simply a bonus you receive after you sign-up at a poker room. You must make a deposit first. It’s fairly straightforward. Note that sign-up bonuses differ from Reload bonuses in that you receive this bonus after the first time you sign up to the poker room, where as a reload is where you get an additional bonus after your first deposit bonus. A Match Bonus is where a poker site will “Match” the deposit you make. For example at PokerStars, they will give you 100% of your deposit directly into your poker account up to $50. If you deposit $50, PokerStars will give you $50 for a total of $100 in your account. Absolute Poker will match your deposit up to $500! You have to sign up through our Absolute Poker link to get that one though as it is an exclusive bonus for our readers. 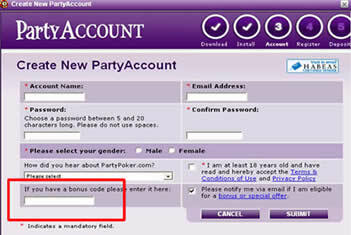 A no deposit bonus at an Internet poker room is simply a bonus you receive when you register a new account. As the title suggest, no deposit is needed and the poker site will credit your account with the free bonus money. This is truly the only Free Poker Bonus that cardrooms will offer their players as you don’t have to use any of your own money to start playing. It is also known as an “Instant Bonus”, since you receive the bonuses instantly into your account to start playing. Poker sites typically offer a no deposit bonus to gain a number of new players quickly. Their hope is that after you receive the bonus and play at their real money tables, you will like the software and continue to play there. 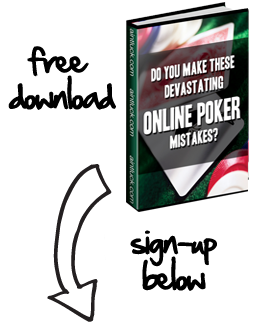 You can think of it as a lead generation tool by the poker rooms. We think of it as free money, let’s eat some fish. Reload Bonuses are great because they reward the loyal online poker player (like yourself) for regular play at a given poker site. They are bonuses that poker rooms give to existing players. Sites like Absolute Poker offer up to 7 or 8 reload bonuses each month for their players. They will typically give you a percentage of your deposit back in the form of free money. This is exactly the same as a deposit bonus but done sometime in the middle of the month. Each poker site has their own version of a poker bonus code. Some poker rooms call it a “Poker Marketing Code”, some a “Poker Referral Code”, “Coupon Code”, “Reload Code”, “Sign-Up Code”, “Referral Number”, and whatever else you can think of. Essentially they are all the same thing, they are a Bonus Code you use when you sign-up for a new account at any of the Internet poker sites. AintLuck.com receives a large number of readers every day, so the online poker sites give us special codes that provide our readers the best possible bonus available at the poker rooms we list. This helps the poker rooms attract the best players to their tables. Most players use poker bonuses as a way to help build their poker bankroll. It allows them to earn quite a bit of free poker money to offset any pots they loose at the online cardrooms so they can become a long-term profitable poker player. We have an excellent guide on how to use poker bonuses to build your bankroll. 1. This sounds to good to be true. Why do Poker Sites give out Free Poker Money? 2. Are Poker Room Bonuses instantly cash-able? Answer: The bonus you receive is an instant bonus, meaning it instantly is credited to your account. However, before it is released into your account as cash to withdrawal, you must play the required amount of raked hands or earn the required poker player points in order for the poker room to allow the release of funds. This is known as the “Play Through Requirement”. 3. How many raked hands or player points do I need to cash out my bonus? What is the Play Thru Requirement? Answer: Each poker site has a different set of criteria regarding the release of their poker bonus. It is important to read our review of each poker room’s bonus code. We have provided a link to each of the card room’s bonuses page at the top of this page. Typically by playing cash games or tournaments, you will earn the required amount of raked hands or poker points to release the bonus. 4. Why do the Card Rooms hold the bonus as opposed to giving it to them instantly? Answer: If the poker rooms gave a bonus upfront to you without any raked hands requirements, many players would just take the money and run. (Note: A No Deposit bonus is an Instant Bonus). The place requirements on the bonuses so that you as a poker player, play at least a few hands. 5. Is the Biggest Poker Bonus always the best deal? Answer: No, and that is one thing you will have to think about. Just because a poker site gives out a big poker bonus, doesn’t mean that it is any easier to get that bonus. We’ve seen $50 bonuses, $200, $500 bonuses, $600 bonuses, $1,000 bonuses, and some as high as $2,000. Those are big bonuses but with large amounts of bonus money comes more wagering requirements. Most times, the bigger the poker bonus, the larger the wager requirement or higher limits you will have to play to receive that bonus.